Green Lantern: Rise of the Manhunters | The Daily P.O.P. Warner Bros. Interactive Entertainment and DC Entertainment today announced the North American release of Green Lantern: Rise of the Manhunters. The action-adventure videogame, inspired by the upcoming Warner Bros. Pictures’ superhero feature film Green Lantern, based on the DC Comics’ character of the same name, is now available on the Xbox 360® video game and entertainment system from Microsoft, the PlayStation®3 computer entertainment system, Wii™; and the Nintendo DS™ and Nintendo 3DS™ handheld systems. The Xbox 360 and PS3™ versions are available to play in both 2D and 3D, and feature the likenesses and voice talent of Ryan Reynolds who reprises his role as Hal Jordan from the movie that opens nationwide June 17. Green Lantern: Rise of the Manhunters is set in the universe of the film with an original story by award-winning comic book writer Marv Wolfman. Players will take flight across the universe to planets Oa, Zamaron and Biot, and utilize an arsenal of constructs to restore intergalactic order by wielding the ultimate weapon: the Green Lantern Power Ring. Gamers playing the Xbox 360 or PS3 versions will also have the option to join forces with a friend to play as Hal Jordan or Sinestro to battle the Manhunters. In addition, players on Xbox 360 and PlayStation®3 system will be given the option to play in anaglyphic 3D with technology that is compatible with high definition TV sets and visible to players wearing the 3D glasses that will be available for the video game. Fans can also enjoy the game in stereoscopic 3D when playing on any 3D HDTV while wearing active shutter glasses that are compatible with the television. Green Lantern: Rise of the Manhunters is developed for Xbox 360 and PS3 by Double Helix Games, and for Wii, Nintendo 3DS and Nintendo DS by Griptonite Games. 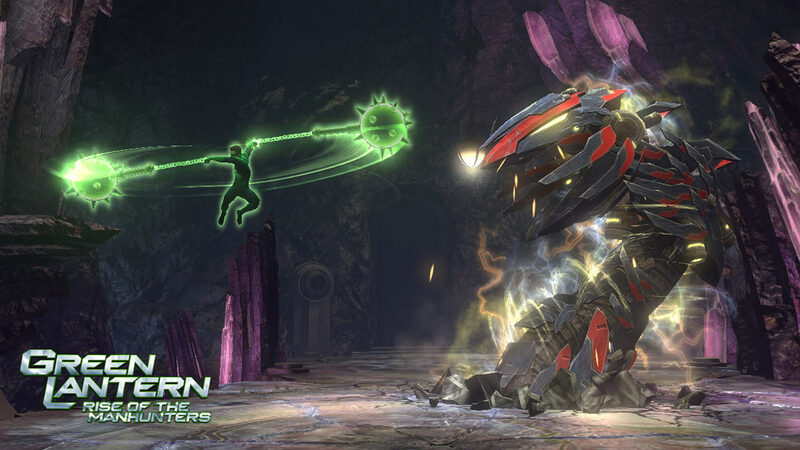 For more information and game updates visit http://www.greenlanternvideogame.com/. This Post was posted in Green Lantern, video games. Bookmark the permalink.